Ken Hitchcock was tired of the dance. In his 22nd year behind an NHL bench, the Dallas Stars head coach decided he would break from the prevalent, league-wide trend of referring publicly to player injuries only as "upper body" or "lower body" ailments. "It's an injury and within two hours after we tell you [the media] it's upper body, you know exactly what it is, so why not just tell you?" Hitchcock said earlier this season. The practice of vague, binary injury designations was adopted decades earlier by coaches who believed they were protecting their players by being vague. They theorized that opponents aware of injury specifics would target the ailing body parts or otherwise exploit the injured players. But Hitchcock does not buy that logic. "The players don't go out and say, 'He has a broken left pinkie, and we're going to go after that pinkie,'" Hitchcock says. "Nobody thinks like that." The "upper body"/"lower body" convention has been allowed to persist because, unlike the NFL, the NHL does not have a policy requiring teams to release injury information publicly. But the practice is under increased scrutiny in an age of distrust for corporate communication and of increased concern around the treatment of concussions - an injury commonly lumped into the "upper body" category. The Dallas Stars suffered another loss on Tuesday night and moved one step closer to forcing general manager Jim Nill to become a seller on March 1. Now seven points back of a playoff spot with exactly three weeks to go until the trade deadline, the Stars must a go on a serious roll. Starting now. And that's not a cliche. The Stars' trade deadline strategy is hanging by the moment. Either the team rips off a massive run here or Nill will have no choice but to start auctioning off some of his pending unrestricted free agents. Topping the list would be cagey veteran Patrick Sharp, whose Stanley Cup experience and creative hands could help any contender. NEW YORK (Oct. 16, 2015) – Tampa Bay Lightning defenseman Nikita Nesterov has been suspended for two games, without pay, for boarding Dallas Stars forward Curtis McKenzie during NHL Game No. 54 in Tampa on Thursday, Oct. 15, the National Hockey League’s Department of Player Safety announced today. The incident occurred at 15:56 of the second period. Nesterov was assessed a major penalty for checking from behind and a game misconduct. Under the terms of the Collective Bargaining Agreement and, based on his average annual salary, Nesterov will forfeit $7,983.88. The money goes to the Players’ Emergency Assistance Fund. Stars just announced that they have acquired Patrick Sharp and Stephen Johns from Chicago in exchange for Trevor Daley and Ryan Garbutt. The Blackhawks are a historically excellent team produced by a model hockey operation. Their three-in-six in the hard cap era is a noteworthy accomplishment. Sharp management is the constant linking this cap era with everything that came before it. That and Scotty Bowman, who keeps finding rings the way kids find Easter eggs. But the rush to canonize these Blackhawks and include them with the dynastic Canadiens, Islanders and Oilers is foolish. Three-in-six is something, all right, but it isn’t four straight, five straight, four-in-five, or 19 straight series. It’s the same as the Red Wings’ three-in-six from 1997-2002, better than the Devils’ three-in-nine from 1995-2003, one more than the Avalanche’s two-in-six from 1996-2001, and though those teams didn’t have to deal with the cap, they did have to deal with one another — and a perennially powerful Dallas team — at the top. And I would take all of those teams over this Blackhawks squad in a fantasy tournament, just as I would take the Red Wings that went four-for-six from 1950-1955 in hypothetical all-time matchups. It’s a double-edged blade. Just as the cap has made it more exponentially more difficult to keep a powerful team intact, it has also diluted the opposition. The bar just isn’t set as high. No great team, by the way, has ever faced less of a challenge than the five-time, 1956-60 champion Canadiens once Detroit ownership exiled Ted Lindsay in the summer of 1957. NEW YORK (March 4, 2015) -- New York Islanders forward Matt Martihas been suspended for one game, without pay, for kneeing Dallas Stars defenseman Trevor Daley during NHL Game No. 948 in Dallas on Tuesday, March 3, the National Hockey League’s Department of Player Safety announced today. The incident occurred at 1:48 of the first period. Martin was assessed a major penalty for kneeing and a game misconduct. Under the terms of the Collective Bargaining Agreement and, based on his average annual salary, Martin will forfeit $5,376.34. The money goes to the Players’ Emergency Assistance Fund. Spezza was OK, and Dallas lost 3-2 to Montreal because Emelin scored the game's first goal and Montreal built 2-0 and 3-1 leads. Stars winger Valeri Nichushkin will have hip surgery this week and be out four months, Dallas general manager Jim Nill said Saturday. Nichushkin has been bothered by hip and groin soreness since September and has come in and out of practices, scrimmages and games. He played two games, missed nine, came back for two more games, and then came out of the lineup again. “We had it diagnosed, and decided surgery is the best thing,” Nill said. “It’s very similar to what (John) Klingberg had, and we expect it to have similar results. Klingberg had double hip surgery in the summer and now is up and skating well. Nichushkin was drafted 10th overall in 2013 and played 79 games last season, tallying 34 points (14 goals, 20 assists). He led the Stars at plus-20. This season, he has played just four games and has no points. ESPN's Scott Burnside penned a fascinating article about the NHL draft as witnessed through the eyes of general managers and assistant general managers, including Toronto Maple Leafs assistant GM Claude Loiselle, Columbus Blue Jackets GM Jarmo Kekalainen, Florida Panthers GM Dale Tallon, Pittsburgh Penguins assistant GM Tom Fitzgerald and Dallas Stars GM Jim Nill. Nill was at the Detroit draft tables when the Wings repeatedly came up with the proverbial diamonds in the rough: Datsyuk with the 171st pick in 1998; Zetterberg at 210 in 1999; Tomas Holmstrom at 257 in 1994. The Red Wings rarely drafted anywhere near the top of the first round thanks to their winning ways during that time, but the mandate was still the same, Nill said: Find good players who could help the team, no matter where the Wings were drafting. "Those were special players. But at the time we didn't know that. You don't know it until three or four years down the road," Nill said. This year's draft will be Nill's second as the GM of the Dallas Stars. It has been a period of evolution for someone who used to be one of the guys who put eyes on hundreds of youngsters at hundreds of games every season. Living in Detroit, he could see junior, college, AHL and NHL games all within a few hours' drive. Not so in Dallas, and his job description precludes those kinds of trips anyway. Just as longtime Detroit GM Ken Holland had to trust Nill and his scouting staff to identify the right players for the Red Wings, Nill now has to step back and convey that trust to the Stars' staff. "I had to hand over the reins," Nill said. "If you're going to be a manager, you're going to have to let it go." I hate that every night during the regular season and playoffs, injuries are so regularly hockey's biggest stories. "I certainly wouldn't rule it out," Bettman said prior to Monday's Game 3 between the Dallas Stars and Anaheim Ducks at American Airlines Center. "It's an unbelievable stadium. I think our focus will be on making sure that when we're ready to come that it will be sold out. All of our outdoor games get sold out, and that's a big stadium." I guess the NHL's annual start-of-the-playoffs crackdown on horizontal stick fouls only counts regarding obstruction and interference, not spearing, stick-swinging or otherwise using one's stick as an instrument of torture. The trip to the postseason is the first for the Stars since 2008, when they made it to the Western Conference Finals. Dallas Stars captain Jamie Benn could be looking forward to some quality time in the press box after this nasty check to Minnesota Wild forward Matt Cooke’s head Saturday. Just seconds into overtime with the score tied 2-2, Benn carried the puck across centre ice and bowled over Cooke with his elbow extended. It’s safe to say NHL disciplinarian Brendan Shanahan will have a good look at this one. Benn would be considered a repeat offender after having been fined $10,000 for a cross-check on Edmonton Oilers forward Ryan Jones last March. As if the hit wasn’t mind-boggling enough, Benn was not penalized on the play. It's been 24 years since Mike Modano left the Prince Albert Raiders and the WHL behind to join the Minnesota North Stars in the NHL, but he still knows his way around town. "It's been a long time," said Modano of his last time in Prince Albert. "A few things have changed here and there, but I still figured out my way around with the rental car." The Prince Albert Raiders are pleased to announce that they will be retiring the first jersey in the 43-year history of the club on Friday November 1st, as Mike Modano’s number 9 will be raised to the rafters of the Art Hauser Centre prior to the Raiders game against the Regina Pats at 7:00 PM. Modano spent three seasons with the Raiders, scoring118 goals and 176 assists for 295 points 176 games. The Livonia, Michigan native was the first Raider player to be selected first overall in the NHL Entry Draft, when he was the top player selected in the 1988 draft by the Minnesota North Stars. Modano had a stellar NHL career, recording 1375 points in 1499 games with the Minnesota North Stars, Dallas Stars and Detroit Red Wings before retiring at the conclusion of the 2010-2011 season. The 8-time NHL All-Star is all-time goal scoring and points leader by an American born player in the NHL and represented his country three times in the Olympics. The 1999 Stanley Cup Champion was inducted into the USA Hockey Hall of Fame last fall, and will have his number retired by the Dallas Stars this season as well. If Mike Modano plays a 21st season in the NHL, it won’t be with the Dallas Stars. The face of the franchise that proved hockey could thrive in the South will not be offered a contract by the Stars when free agency opens Thursday. That difficult decision had to be made by Modano’s teammate-turned-boss, Stars general manager Joe Nieuwendyk. They won a Stanley Cup together 11 years ago — the only title in franchise history — but the Stars have missed the playoffs in consecutive seasons for the first time since moving from Minnesota in 1993. Nieuwendyk said the team needs to make room for younger players in trying to rebuild, and has too many players who need ice time at center. Veteran free agent forward Mike Modano doesn’t seem to be expecting to return to the Dallas Stars, according to a report from ESPN. The 40-year-old says he will wait until at least July before he decides on what he will do with his future; free agency begins on July 1 in the NHL. Taking the best player available is a pretty good strategy for any draft. It’s especially important in the NHL, where teams take 18-year-olds and have to guess how they will develop. So it’s understandable that the Stars have taken only two defensemen in the last 18 picks, including none last season. There were better players, and Dallas had really gotten into the strategy of going after highly skilled forwards – a strategy that paid off with players like James Neal (33rd overall in 2005), Jamie Benn (129th in 2007), and all five of last year’s talented forwards. There’s a report the City of Charlottetown and the Dallas Stars are close to signing a deal that would bring a portion of the NHL club’s training camp to Prince Edward Island this fall. The Charlottetown Guardian cites a report in the Dallas Morning News that says the Stars are “pondering having part of training camp” on Prince Edward Island. Wayne Long, Charlottetown’s events development officer, declined comment when asked about the story. 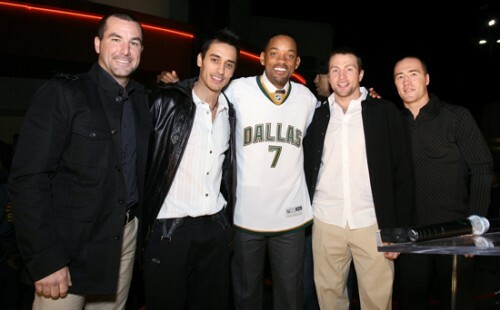 Will Smith met up with some Dallas Stars at the premiere of his movie Seven Pounds. It’s been a busy week for Brad Richards. On Tuesday he was traded from the Tampa Bay Lightning to the Dallas Stars along with Johan Holmqvist for Mike Smith, Jeff Halpern, Jussi Jokinen and a fourth-round pick in 2009. Last night he played in his first game for the Stars and made it a memorable one by becoming the first player in NHL history to record five assists in his first game with a team as Dallas defeated the Chicago Blackhawks 7 to 4. Today, Richards participated in an NHL teleconference and below is the transcript of that Q&A with various members of the media. The Dallas Stars announced today that the club has placed defenseman Philippe Boucher on the injured reserve list and have recalled right wing Junior Lessard from the Iowa Stars, Dallas’ primary development affiliate in the American Hockey League. Philadelphia Flyers center Daniel Briere, Phoenix Coyotes goaltender Ilya Bryzgalov and Dallas Stars goaltender Mike Smith have been named the NHL’s ‘Three Stars’ for the week ending November 25. Stars right wing Jere Lehtinen will be out indefinitely with an abdominal strain, but might not need surgery as the team originally thought, coach Dave Tippett said after Friday night’s 3-1 win over the Toronto Maple Leafs. The Dallas Stars announced today that left wing Todd Fedoruk has been claimed off re-entry waivers by the Minnesota Wild. The Stars and Wild will split Fedoruk’s salary (signed one-year deal for $875,000 in off-season) for the remainder of the 2007-08 season. Did Brett Hull Save JFJ’s Job? Is it possible that Brett Hull might save Toronto Maple Leafs general manager John Ferguson, Jr.‘s job? Seems illogical, but then logic rarely is a dominant theme at Maple Leaf Sports and Entertainment, a behemoth in terms of producing revenue, but a consistent failure in terms of on-ice success in the NHL. The buzz for weeks has been that MLSE’s board of directors has been contemplating Ferguson’s dismissal, but the recent appointment of Hull as interim co-director of the Dallas Stars may have made an impact in Toronto. The argument in favor of keeping the beleaguered Ferguson has long centered on a simple question: “Who can we get to replace him?” That question gave the board some pause this past offseason when several high profile (and under contract) GMs quietly let it be known they weren’t interested in the board’s plan to bring in an experienced hockey man to “mentor” Ferguson.